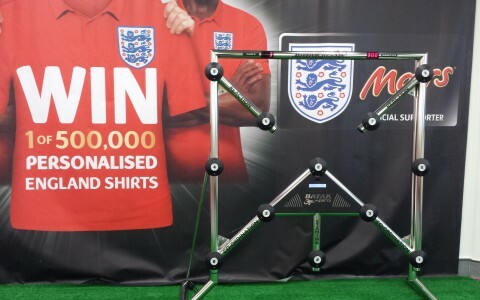 Here at Altitude Events, we provide the latest top of the range model of Batak available called Batak Pro. Featuring 12 LED targets that are numbered and arranged in a ‘maximum stretch’ type configuration on the Batak’s frame, they are controlled by a dedicated on-board computer allowing them to light up in a complete random order, testing those playing to the max! Batak has up to 31 game modes, with the most popular being a 30second challenge to get the high score. This allows good throughput and a real sense or competitiveness throughout! A simple yet addictive game where you have to hit the button that lights up as fast as possible before the next button will then illuminate. This continues until you run out of time with successful hits being scored on a central display screen. The Batak Pro reaction game is suitable for hire for both adults and children alike as using the various game modes we can easily turn off the highest rows of buttons for events with lots of children attending. Altitude’s Batak rental service has been used extensively on Corporate Events, Team Building Days, Family Fundays and at Private Parties, Scout and Guide Camps. Batak Pro is also often used in Schools, Colleges and Universities as well as for sports training programmes. Batak hire is also used with great success on Roadshows and for Marketing, Publicity and Promotional events such as exhibitions or trade show stands where its addictive playability always brings the crowds in. The sleek polished chrome frame of the Batak Pro makes a very striking and impressive addition to any event, show or exhibition stand. Altitude’s Batak Pro hire service is based in East Sussex but also operates throughout the Southeast (Kent, Surrey, West Sussex, London, Hampshire, Berkshire, Essex, Buckinghamshire and Hertfordshire) and further afield.